The new museum is above the RGLI Regimental Museum which opened in 2009 and is in very much the same style with dark rooms in which there are lighted cabinets containing exhibits and information about them, several of them in tableau form. On entering the museum the first display illustrates the reason for the original formation of a Militia as it depicts one of many French attempts to take the Channel Islands from the English crown. Visitors can press button highlighting particular parts of the tableau and giving further information about them. Below some of them are drawers, containing medals and other items, which visitors can open and view. Life-size historical figure models feature among the displays which also include videos and a database of all the Museum's photographs from its Militia Archive. I did not get an opportunity to use the interactive computer which is another feature of the new museum on this visit as it was very busy but hope to do so in future. After the opening ceremony and a quick visit to the new museum guests were invited to watch the firing of the noon day gun, and this was followed by a reception in the Amherst Room. 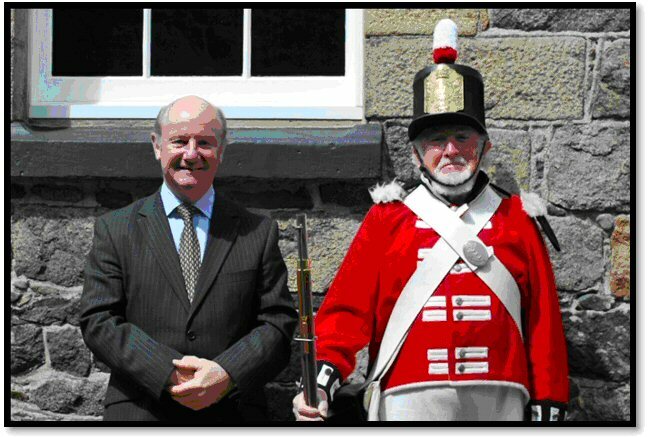 The newly refurbished Royal Guernsey Militia Museum in Castle Cornet was opened on the 24th May, 2011 by the new Lieutenant Governor, Air Marshal Peter Walker CB, CBE. Mark Bougourd and I were lucky enough to be invited to the opening ceremony. 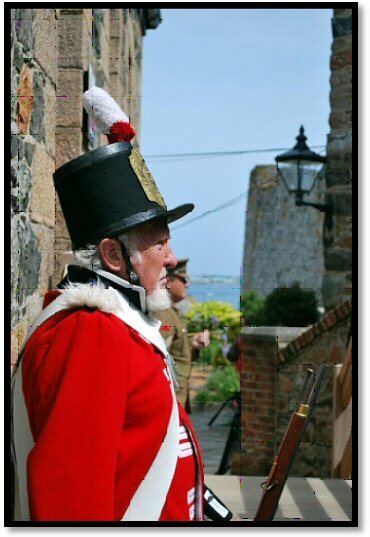 We were greeted on arrival by the sight of two sentries posted outside the museum entrance. 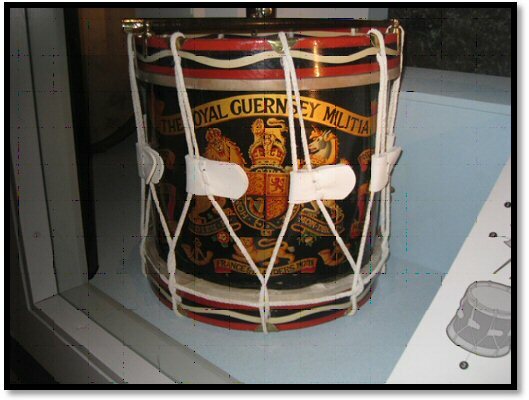 One was Guernsey History in Action Group member Brian Garner who was in Militia uniform, the other was our own Russell Doherty in the uniform of a member of the Royal Guernsey Light Infantry (RGLI). The Lieutenant Governor made a short speech, before using a medieval sword to cut the red satin ribbon that had been tied across the museum's doorway. There were also speeches from Culture and Leisure minister Mike O'Hara and Director of Museum Services Jason Monaghan. The new museum is on the same site as the previous Militia Museum, in what was originally the castle's hospital building, and contains many of the original exhibits but the interior has been completely refurbished. 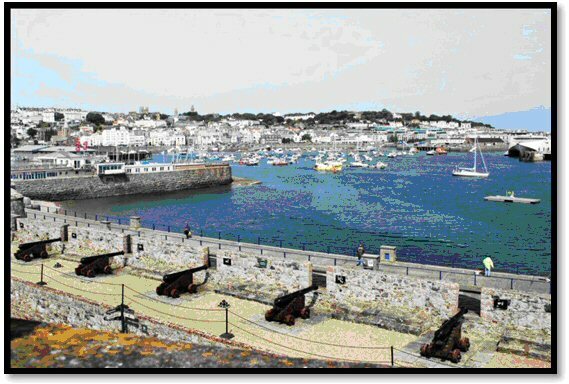 The aim is to tell the story of the Militia from its formation in the 14th century to its disbandment in the 20th century. Over the last three years it has been closed to the public while the museum service staff led by Matt Harvey carried out detailed research and designed the new display areas. They were also responsible for cleaning and conserving the items on display. All in all it was a pleasantly informal ceremony on a beautiful day which allowed us not only to have a first look at the new museum but also to see the castle at its best.